The first supply of Christmas Ales arrived today with the delviery of the Santas Winter Warmer, Dasher the Flasher and the Brewferm Grand Cru. I am still waiting for Ritchies to release the latest batch of Bah Humbug stout, but expect that it will be available around Mid October. I haven't ordered in any of the Milestones Donner and Blitzed, but will order a box in if anybody would like some. After what seems like an interminal wait since their launch was announced, the brand new Festival Premium Ale range from Ritchies has finally arrived in store. They have already proved so popular with the retailers that Ritchies are close to running out and have already begun producing a new batch of each. Ritchies have announced the release of a brand new range of premium quality, two can kits which will contain 3kgs of Malt Extract, Genuine brewers yeast strains to match the beer style and packs of hop pellets to allow home brewers to boost the aroma and flavour of their brews.The new range will be marketed under the "Festival Premium Ales" brand and will initially comprise six varietal beer kits that aim to match well known beer styles and allow you to create your own mini Beer Festival at home. 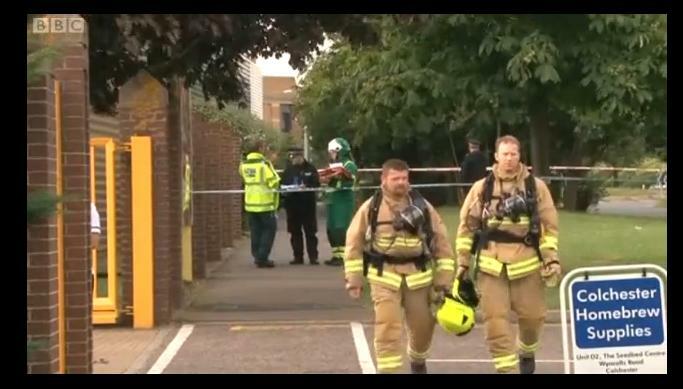 We had a bit of excitement yesterday when the whole of Severalls Business Park, including the part in which we are based, was brought to a standstill becasue of a mystery chemical/fume release. A group of council workers in one of the nearby buildings reported feeling unwell as a result of inhaling fumes and before we knew it, the estate was cordoned off and a 400m exclusion zone had been created. At one point we had numerous police cars, 6 fire engines and 12 ambulances in the area and even the BBC Look East news crew. The estate returned to normal about 7.00pm last night and we have been allowed to open as normal this morning. As the air temperature starts to increase, the pressure in barrels will start to increase as well and even barrels fitted with a pressure vent system may well start to leak from around the tap. Woodfordes and Muntons have finally released the Sundew Ale kit that has been created as a replacement for the withdrawn Great Eastern Ale. Hambleton Bard have recently introduced a brand new range of floppy pouch beer kits that contain between 1.8 and 2.1kgs of malt extract and make 40 pints of Lager, Pilsner, IPA, Yorkshire Bitter, Brown Ale, Mild or Stout. Each kit is made up of specially selected Malt Extracts from a variety of specialist malsters (ie these are not Munton's Kits) and matched with an appropriate strain of yeast in an effort to produce a more authentic version of the particular beer style than would be available from kits made with generic brewing yeast. Many people making homebrewed lager are disappointed with the results becasue they don't end up with a brew that is overly close to a commercial lager. This isn't because homebrew lager kits are poor quality, just that lager can actually be quite difficult to get absolutely right. Commercial brewers ferment lagers at much lower temperatures than beers and ales and also tend not to bottle condition their products. The long awaited replacement for the popular, but now withdrawn, Woodfordes Great Eastern Ale kit, has finally been approved by the Woodfordes head brewer and is due to be released in the middle of April. Called Sundew Ale it will be a light golden, lightly hopped, citrusy beer at an expected strength of approximately 4.1% ABV. It is nearly that time of year again when the Elderflowers start to bloom and people want to make "Elderflower Wine" and "Elderflower Champagne". If you have made wine before, it is relatively straightforward to make both of these varieties, but many online (and TV) guides suggest that it is really easy to do it without any experience, equipment or common sense.